Accidentally promoted far beyond their level of competence Detective Constables Bob Louis and David Briggs stumble from crime to crime relying on a unique blend of intuition, hunches and inspired guesses ... all of them hopelessly wrong!.. Own The Detectives Series 2 DVD from Deff, DVD, Blu-Ray & 4K Video Specialists - Free UK Delivery.. Incompetent, inept and usually in trouble, Detective Constables Louis and Briggs have set back the fight against crime ten years. So why does Superintendent Cottam always find himself awarding the commendations?.. 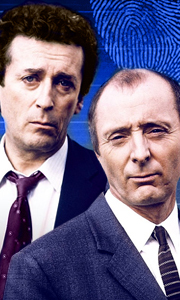 Own The Detectives Series 4 DVD from Deff, DVD, Blu-Ray & 4K Video Specialists - Free UK Delivery..
Own The Detectives Series 5 DVD from Deff, DVD, Blu-Ray & 4K Video Specialists - Free UK Delivery..